Guitarists: Do you know how the strings, frets, notes, scales and chords all work together to make music? Whether you're a total beginner or have been at it for years, there's a good chance you lack a basic understanding of the theory behind what you're playing. 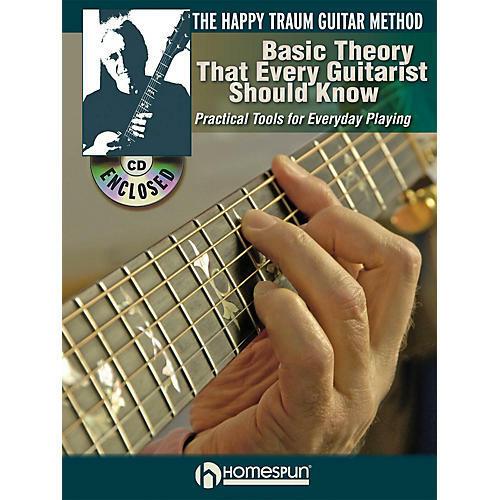 In this book and accompanying CD, Happy Traum, one of the world's best-known guitar teachers, demystifies the guitar fretboard and brings it into focus for learning players. He starts at the very beginning, providing the essential knowledge needed to become a better guitarist. This pack also teaches: movable three- and four-string chord shapes; the basic chord progressions that bring these shapes into practical application; scales and chords in major and minor keys; how to transpose from one key to another; using harmonized scales; building chord progressions; and much more!